Interview with Aldis Hodge of "Leverage" on TNT 6/9/11. This is the second time I was fortunate enough to speak to Aldis. He seems like such a nice, down-to-earth guy. Leverage is a great show, and I recommend everyone watch it. It's definitely one of my favorites. All the actors are wonderful in it, the writing is fantastic, and there is a lot of humor and action as well as great drama. Operator: Good day and welcome to the Turner Entertainment hosted Aldis Hodge Leverage conference call. Today’s call is being recorded. At this time I’d like to turn the conference over to Ms. Wendy Levison. Please go ahead. Wendy Levison: Good afternoon. Thank you for joining the Aldis Hodge Leverage conference call. Leverage premieres Sunday, June 26 at 9:00 pm Eastern/Pacific on TNT. The conference call is now open for question. Please press star 1 to ask a question. Thank you. Operator: And once again everyone if you wish to ask a question today, you can do so by pressing the star key followed by the digit 1 on your telephone keypad. Keep in mind if you are using a speakerphone today please release your mute function to allow the signal to reach the equipment. Once again star 1 for questions. And we will take the first question from Mike Desotell with Eagle Herald Newspaper. Go ahead please. Mike Desotell: Good morning Aldis. How are you? Aldis Hodge: Hey. I’m doing fine. How are you doing? Mike Desotell: Great. Hey one of the things that struck me when reading a little bit about your bio is that you actually played the violin and I did see you doing that in one of your episodes. Right. Aldis Hodge: Oh yeah. She has a lot of jazz. Mike Desotell: Any plans to hear - now was that actually you playing during that? Aldis Hodge: While we filmed it, I actually played to a track. It’s much easier for editing when I can play to the track without mistakes but I did learn the song and I played it terribly but I did play it. It’s a beautiful song though. Mike Desotell: Oh cool. Any other opportunities coming up to hear your music in future episodes do you think? Aldis Hodge: I’m not sure but this is actually a pretty common and familiar question so I’m thinking we might have to revisit that if that’s what the people want. Mike Desotell: Oh cool. And the other question I have and I don’t want to take a lot of your time because I know there’s going to be a lot of people waiting for you but you got started pretty young; about 11 - 12 years old with - between Brothers and NYPD Blue. How did you - how did your talents get discovered and, you know, how did you pursue them to greater things. Aldis Hodge: Let’s see. Well I started when I was 3 years old in New York. My brother and I we were on Sesame Street for about two years and then, you know, we did a few things here and there. I did a film called Die Hard with a Vengeance and then after that we ended up on Broadway for about two and a half years. Really I was watching my brother because he’s - my brother, Edwin Hodge, he’s the one who started first and I followed suit and I just kind of learned from and was inspired by him doing it at first. And my mom just, you know, she supported me and allowed me to do - to pursue my dreams. So we had to really - she made us earn this acting thing. So, you know, it were forced us to actually learn the world we were in, immerse ourselves in the craft of it and try to be our best at it because we wanted it and we had to earn it. It wasn’t given to us. Mike Desotell: Well having Marines as parents I guess can be a little tough but rewarding at the same time. 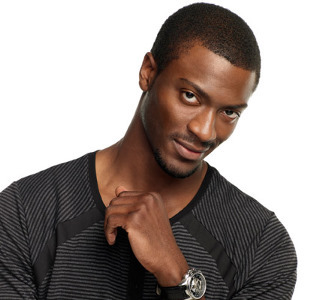 Aldis Hodge: She was definitely strict but my mother’s a sweet lady. She’s one of the sweetest ladies I know. She’s the best lady I know. So yeah. She was very much a discipline enforcer though and all about the education. Mike Desotell: Aldis, thank you very much. Aldis Hodge: I’m not mad at it because it’s gotten me where I am today so. Mike Desotell: Well, there you go. Well thank you so much and it’s been a pleasure. Thank you. Operator: And we’ll now take a question from Jenny Rarden with tvismypacifier.com. Jenny Rarden: Hi. Thank you. I’m a huge fan of the show. My husband and I watched it from the beginning and it’s been great to see all of the characters kind of have grown since the beginning. One thing we saw last season was the relationship between Hardison and Parker start to grow; especially in the second half of the season. And then in the season premiere, you know, we see them kind of apart. I mean we don’t really see much between the two of them specifically until the end I guess when it’s a thank God you’re okay type of situation. What can we see from the season this year? Aldis Hodge: Absence makes the heart grow fonder. Parker and Hardison - they definitely take major steps as far as, you know, realizing their affection for one another and how they feel. And they’re growing. They definitely grow emotionally. They - their bond of friendship grows and gets a lot stronger this season. Jenny Rarden: Well excellent. We’re routing for it because I think you just - you guys make just the cutest pair. So. Aldis Hodge: Oh, thank you. Jenny Rarden: And then I had one other quick question. Nate’s drinking. How is that going to affect at all - is it going to affect at all this season? Aldis Hodge: You know I think at this point the team is used to having a drunk and I think they just let him go his way. You know, we’ll see how it plays out. I can’t say anything on it because I want the audience to see. But it does play out a little bit early this season but as far as Hardison’s character, specifically, you know, I think he understands who Nate is and who Nate has been for the past few years. So he’s, you know, just - he’s always just about look, you do what you want to do as long as we get the job done. Jenny Rarden: Right. All right. Well, I can’t wait to see the rest of the season so thank you very much. Aldis Hodge: Thank you very much Jenny. Operator: Now I would like to remind everyone star 1 for questions and we are going to ask that you limit yourself to one question to allow maximum participation with Q&A today. And now we will move to a question from Danielle Turchiano with LA Examiner. Please go ahead. Danielle Turchiano: Hey. Thanks for doing the call today. Aldis Hodge: Thanks Danielle. Hey. Danielle Turchiano: So the season opener obviously started with the Big Bang. I’m wondering if you can talk a little bit about what’s coming up for Hardison and what - in terms of what was the most fun for you to shoot; maybe a scene or a moment from a future season four episode. Aldis Hodge: Well my favorite episode to shoot - I have to say (not) episode 4 or 5 (a bank roll job). I basically got to play young Danny Glover because he comes in. He’s narrating his story and the characters go back in time and we met. We are seen as the character that he’s telling the story about so, you know, I get to basically be the younger version of him which is an honor to because it Danny Glover. It’s like acting royalty right there. So I was really honored to have that experience and that opportunity but as far as like where - what’s going on with Hardison for this season. I think he’s been forced more than, you know, more than a couple of times to challenge his romantic feelings for Parker and that’s something he’s trying to figure out. I think that, out of all things, is his biggest adversary. Danielle Turchiano: And this is a quick follow-up. In the Danny Glover homage episode, do you get to do any stunts or any fight scenes. Aldis Hodge: I can’t tell you that. Danielle Turchiano: I know. I’ve got to try. Aldis Hodge: There’s a lot of running. I can tell you that. Danielle Turchiano: All right. Awesome. Thank you. Aldis Hodge: You’re welcome. You’ve gotta watch. Danielle Turchiano: Okay. I will. Aldis Hodge: There’s a lot of exciting stuff. A lot of exciting stuff. Operator: And now moving to a question from Lena Lamoray with lenalamoray.com. Lena Lamoray: Hello. This is a pleasure to speak with you. Lena Lamoray: Now wasn’t the premiere episode how Hardison was reminded of all his climbing failures. Can you share any funny stories with regard to that? Aldis Hodge: Yeah. Which episodes? Lena Lamoray: How they remind you of all your climbing failures? Can you share any funny stories ((inaudible))? Aldis Hodge: Can you repeat that one more time. It just broke up a little bit. Lena Lamoray: Okay. Can you share any funny stories from the set with us? Aldis Hodge: Oh - there. I’m sorry. There you go. Oh yeah. That was - it was an amazing time because we actually went to Mount Hood - we were shooting on the mountain and it just so happened that during our shooting time, they had the warning for the biggest blizzard that they’ve had in their history and we actually did - it was going on as we were shooting. So we had that to deal with. But we had scenes where we were supposed to be coming in out of the snow all, you know, snowed up and all cold and all that kind of stuff and whenever they told us to go get snowed up, you know, like the director and production, they really - when they said that, they meant okay. Have makeup come around, toss some snow on us - a little fake snow and have us go do our thing. The cast - our interpretation of it was go outside, go jump into the big pile of snow that was like ten feet down on set - you know, the first floor. So we were stuck on the second or third story. I don’t know. And we kept jumping into the piles of snow. We kept having snowball fights in between takes and then we would come in and do the scene. But we would do that every single take. Lena Lamoray: Okay. Thank you so much. Operator: And now we’ll hear from Suzanne Lanoue with the TV Megasite. Suzanne Lanoue: Hi, Aldis. Nice to talk with you again. Aldis Hodge: Hi. Thank you. Thank you. Suzanne Lanoue: So now you’ve had four years of the show. What - is there anything major that changed for you that you can think of like are you recognized more or what’s the biggest change? Aldis Hodge: The response has definitely been amazing. We’ve been fortunate enough to have very loyal fans. There’s a woman who goes by the moniker (Alley Cat Who) who’s built a fan site for me. I believe it’s Aldis-Hodge.com. And she’s doing that of her own free will and to have somebody like actually put and invest their time to make a fan site around me - to me that blows my mind. I never really - I used to see it happen for like all these like celebrities and stars and you know, those kind of people. Aldis Hodge: And to have somebody do that for me is truly mind-blowing. I still don’t really even understand it. It’s great. But she’s done that and it’s really nice when you can walk around town and you know, the people that do recognize, they give respect and they show respect and they, you know, show that they appreciate your work because that’s what this is really all about. I just want to make sure that I’m doing the right job and that people appreciate the effort that I’m putting in and it shows. So that kind of an experience I can’t really - it’s very hard to duplicate. It’s very hard to explain but to have that in my life right now is really amazing and I’m truly blessed. Suzanne Lanoue: It doesn’t sound like success has changed you much so keep up the good work. Operator: And as a reminder, star 1 if you have a question. We’ll now move to Stefan Blitz Forces of Geek. Go ahead please. Stefan Blitz: Hey Aldis. How are you today? Aldis Hodge: What’s happening? I’m doing good. How are you doing? Stefan Blitz: I’m good. I want to actually ask you something about you currently have 43 point - 19% of the vote on entertainment weekly to play Jackie Robinson. What - if you were to, you know, actually get the part, what’s ((inaudible)) to play Mr. Robinson. Stefan Blitz: Well yeah. I mean what about Mr. Robinson obviously besides his, you know, legendary status as a character would draw you to play him. Stefan Blitz: You are - yeah. I mean. Stefan Blitz: You are the next highest is almost 18%. You have more than double the second runner up. Aldis Hodge: That’s awesome. That is freaking awesome. I’ve got to check that out. Stefan Blitz: So if the producers were looking at this and saying, you know what, let’s bring him in to talk about the part, what draws you to - what would draw you to playing - to play Jackie Robinson. Aldis Hodge: Well it’s the fact that Jackie Robinson is such a pioneer in his day. He had so much going against him in his timeframe; you know, with his ambition. And I think a little bit of that draws me still today for certain types of people and, you know, any time that you are that much of - I don’t want to say a martyr but in a sense, he put himself out there in a world that really was saying hey, you have no chance. You’re going to fail. And he did it. He broke through. He made a change and he contributed so much more to sports and even more to just the way of life and the way people think on a daily basis. You know, and in a sense, I would say - in a sense of sports, you know, he’s you know like, you know, MLK or Malcolm X to politics. You know what I’m saying? So if ever I did get the chance to play such an honorable person, that would - I mean that would be - yeah, that would be like a dream for me. You know, whoever it is. But man, Jackie Robinson. Man, he’s - that’s the guy. Stefan Blitz: Now, you know, the producers have to go to Entertainment Weekly and bring you in. So best of luck with everything in the new season. Aldis Hodge: (I got to) go on there and check it out. Stefan Blitz: Is it - well I saw it on your Facebook page and I read and I was like you had the opportunity to see the results and I mean it was like, you know, you are by far the favorite. Stefan Blitz: Well good luck with everything. Aldis Hodge: Thank you very much. Operator: And we’ll take our final question today from Melissa Miller with Small Screen Scoop. Go ahead please. Melissa Miller: Hi, thanks for talking today. Aldis Hodge: Hey, thank you. Melissa Miller: My question was do you have any favorite, you know, Hardison gets all the toys, all the text. Do you have any favorite texting that he’s done or he’s going to be doing at any point this season that really stood out to you? Aldis Hodge: Let’s see. Let me see, let me see, let me see, let me see. I think - I’m not certain about this season just yet. I know last season I really had fun with the EMP gun. That was pretty cool. Aldis Hodge: But this season - I mean we still have so much more to go. We’ve got eight more episodes so I think I’ll have to get back to you on that. Aldis Hodge: Yeah. No some think that all the time and I disappoint people all the time and I’m like look guys. I read lines. I’m an actor. I - my job is to pretend professionally. So you’ve got to realize that. But yeah. No, people think that I’m some kind of wiz and you know just I’m not. But you know I’ve learned a little bit along the way. It’s still not enough to be anywhere near the - in competition with my character but I’m getting by. Melissa Miller: That’s cool. That’s cool. And then just because I’m last I want to ask one last thing. How many times did you rehearse the State Farm jingle before you did the commercial? Aldis Hodge: Oh Lord. I don’t rehearsals, I just shoot. Melissa Miller: Okay. I just see like you in the mirror singing the State Farm thing. Aldis Hodge: The problem ((inaudible)). Melissa Miller: Awesome. Okay. Well thank you. Aldis Hodge: Thank you. And it’s Melissa right. Operator: That was Melissa. That’s correct. And that will conclude today’s question and answer session. I’ll turn the call back over to Wendy for closing remarks. Wendy Levison: Thank you so much for joining today’s call. As a reminder Leverage premieres Sundays, June 26 at 9:00 pm Eastern/Pacific on TNT. A transcript of this call will be available within 24 hours. Thank you Aldis and thank you all for participating. Operator: And that does conclude today’s call. Thank you for your participation.